You might say Eric Young Jr. has baseball in his blood. Growing up he became acquainted with the game early by watching his father, Eric Young Sr., play for the Dodgers, Rockies, Blue Jays, and Cubs, among other teams. Eric Young Jr. (or EY2., as he is known) was a multi-sport athlete in high school, but ultimately decided to pursue baseball. He played one year of college ball at Chandler Gilbert Community College before following in his father’s footsteps and being drafted by the Colorado Rockies in the 30th round of the 2003 draft. EY2 steadily worked his way through the minor leagues, posting solid batting averages at every level and catching the eyes of the Rockies’ front office, which resulted in his major league debut in 2009. In 158 career major league games EY2 has posted a line of .246/.324/.295 and spent time playing second base and patrolling the outfield. This year the 26-year old will again look to provide the Rockies with production off the bench. i had a chance to chat with Eric Young Jr., and discovered his favorite foods, his go-to songs on his iPod, and what it means to him to share so many baseball memories with his father. HALEY: At what age did you start playing baseball? And did you eventually end up playing in a travel league? HALEY: Who was your favorite team growing up? And other then your father, who where some of the players that you looked up to as a kid? EYJr: Favorite team growing up was whichever team my dad was on. I was a big Ken Griffey Jr fan growing up. HALEY: When you are up to bat what is your theme song? EYJr: I’m going with Drake “Headlines” this season, and maybe the Bernie. Still debating on that one. HALEY: Do you have a favorite restaurant in Colorado? And what is your favorite food? HALEY: Do you have any rituals or superstitions before and during a game? Can you give me an example? EYJr: I try to eat healthy before a game, usually oatmeal. Music headphones on a bunch. HALEY: What do you do during the off-season? EYJr: Try to get enoughrest before getting back to training, and visit my family members. HALEY: Refuse 2 Be Ignored is one of your slogans can explain what it means to you. EYJr: It means embrace all/any of your talents. Refuse to ignore what your good at/makes you special to the world in your own right. I just love to encourage people to find what their gift is to the world. 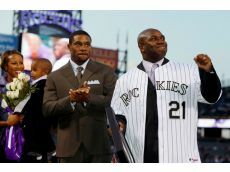 HALEY: You and your father hold a historical moment with the Rockies organization; can you tell use about it? EYJr: We have a few. His opening home run in Denver, my debut in ’09, our playing against each other in spring training. Its all been a blessing to our family. HALEY: At the 2012 Winter Meetings your name came up in several trade possibilities including the Mets, Tigers and Mariners, if you could play for any team who would it be? EYJr: I just want to play and utilize my abilities to my max potential. It doesn’t matter where. HALEY: What trade or free agent player signing will have the biggest effect on their teams chances of making it to World Series? EYJr: You never know before the season starts. You have to see how the teams gel together when they get new personalities to a team. HALEY: Four of the fastest men currently in MLB – EYjr, Brett Gardner, Michael Bourn and Carl Crawford who is the fastest? EYJr: You always have to believe in yourself, so I’m saying me. All those names can fly though. I enjoy watching all those other names play the game of baseball. EYJr: I can see myself as a barber. HALEY: Any reason for number 1? EYJr: Number 1 was my original number when I was 7 years old. HALEY: Do you have any other nicknames then Base Burner or EY2? HALEY: What was the difference playing winter ball in Hawaii and Venezuela? EYJr: Hawaii is a state and Venezuela is another country. The difference in cultures is the biggest difference. HALEY: What advice would you give to the young readers? EYJr: Find what you’re special at and embrace it. I love to play ball and cut hair…so I’m giving it all I have.